Vivitreats are a new treat for dogs on any medication. Designed to help alleviate problems that dog owners often have administering tablets long-term, which can lead to vital tablets being missed or treatment being abandoned, Vivitreat is a soft and tasty treat that owners can use to administer any medication. The medication is disguised within the treat by inserting the tablet into its centre and moulding the Vivitreat around it until completely enclosed. 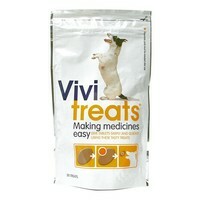 The ViVi Treats are the best thing - it is great for hiding pills for my dog and makes giving meds stress free! This product was a game changer for Casper and me. He's always been the worst for taking his medicine no matter how administered. Lately, he's on several pills a day and we were frazzled with the inevitable wrestling matches when a vet friend recommended Vivitreats. We haven't looked back since - no chance of forgetting his meds as he makes sure to remind me! These really are excellent. I was looking for something much cheaper than a similar product I had found on Amazon, which was also good but too expensive for me. My Skye terrier loves these treats and it is so much more of a pleasant experience now to get the four types of medication down him - twice a day! It is so good to see an empty bowl without any mangled capsules with their contents spilling out everywhere. Stress-free medication giving! My dog is a nightmare when it comes to taking tablets. This product enables me to insert the tablet into one of these treats and my dogs wolfs them down. He now gets really excited when it is his tablet time. Fantastic treat, easy to mould around tablets, my dog is happy to take her daily medication with these. I used to have to crush my dog's arthritis medicine and mix it in with a tin of wet food to get her to take it. This is so much easier, and she loves them - probably because they stink to high heaven! I highly recommend this product. These treats have proved fantastic, especially for giving capsules, which are not easy to get a small dog to swallow and which used to involve quite a struggle, usually ending up with the capsules split and most of the content on the kitchen floor tiles. The vivitreats are very easy to mould around the tablet/capsule and my dog absolutely loves them. She now waits eagerly by the kitchen cupboard every morning until she has had them. My dig has to take tablets twice a day and nothing seemed to work. The vivitreat is very easy to use as it masks the tablet. This makes it easy for me to pop it into her mouth and she will swallow. No more spitting it out! Great product!! I bought this product for my lurcher who has recently been diagnosed with heart disease and has to take many, many pills! When offered the treat she turned her nose up at it and would not touch it. She can be quite fussy when it comes to treats so I tried (an "empty") one on our cocker spaniel; he wolfed it down in a second. I don't think I would buy these again as I have found that pills wrapped in cooked chicken pieces do just as well (and are a lot cheaper). However, if you don't have a fussy dog, these would be ideal to avoid the potential mess and frustration of trying to medicate your dog. The treats were easy to mould and were pleasant to handle. A brilliant product! I do miss the wrestling sessions though . . .
My dog has Cushings disease, which involves six pills a day. I used to try and hide them in her food, hoping she would not find them and spit them out. The vivitreats are soft, malleable, and can be shapped around the pill. The main point, she loves them and I have no problem with her taking pills. For once no hassle administering my dog's worming tablets, these were the easiest tablets I have ever given! I am amazed he was fooled, being a Border Collie but he took the Vivitreat in one go and did not notice the tablet. Would highly recommend this product, less stress for both dog and owner alike.